The digital revolution has arrived in banking. Evolving customer expectations, increasing cyber threats and growing volumes of data are just a few of the challenges faced by traditional financial institutions. To keep pace with emerging fintech startups, they must fundamentally transform, implementing solutions which better capture, organize and analyze data from all sources while ensuring information governance and data security. 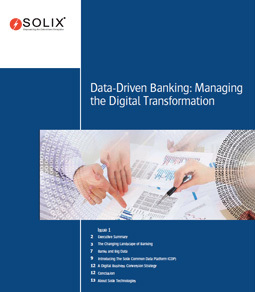 Download our latest white paper to explore how big data technologies like the Solix Common Data Platform are empowering financial institutions to move beyond using IT for traditional processes and begin leveraging it for data-driven banking.